In the real estate business, it’s common to hear buyers contemplate about the best time to buy. The problem with these sentiments is that they overlook the impact of mortgage rates. For cash buyers, it’s simple. Buy low. For the majority of the nation who needs financing, they should consider the (1) price and (2) interest rates when deciding whether to buy. If prices decrease yet rates increase, then the monthly mortgage payment may be similar to buying in a higher-priced market with lower rates. Take the following examples, which are not offers to extend credit and are merely to convey an idea. 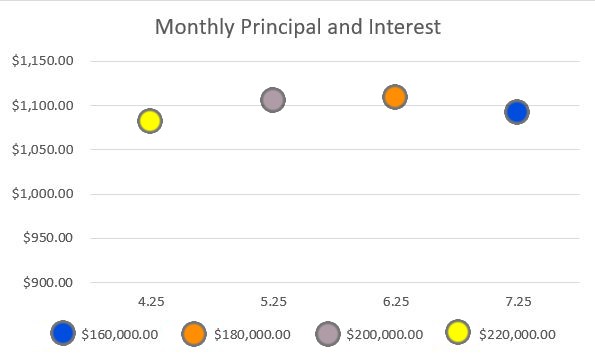 A loan for $220,000 with a 4.25% interest rate yields a $1,082.27 payment for principal and interest over 30 years. Now imagine interest rates are higher at 5.25%. The payment for principal and interest over 30 years for $200,000 is about $22 more a month at $1,104.41, which is $20,000 less than the $220,000 loan. The trend continues as shown in the graph. The payments for loans of $160,000, $180,000, $200,000 and $220,000 are close to each other as interest rates go down by 1% each, respectively. At the end of the day, the cost of a home doesn’t stop at its price — it’s the amount of money that leaves your checking account each month until you own the home free and clear. Whether more or less goes toward the price of a home or the interest on the loan, it is ultimately about the total cost you pay. If you have any questions about this, call my team at Florida Mortgage Firm at 813-707-6200.